All along this article, we will use various charts that were created by customizing the Bogleheads Simba backtesting spreadsheet. We will assume a fixed asset allocation (no glide path), 30 years retirement periods, and explore what would have happened in the past history for a retired investor living on his/her portfolio (setting aside fixed income considerations, e.g. social security and pensions). Most tests are very easy to reproduce for interested readers, just download the Simba spreadsheet following instructions on this Wiki page. It turns out that the starting year is really crucial (starting in 1972 with a one M$ is very different from starting in 1974 with the same amount), therefore we will use charts showing the diversity of outcomes for each starting year, and compare two portfolios (i.e. two asset allocations) side by side over such wide spectrum. On such charts (see examples below), the 1972 data point (horizontal axis) would capture a given metric (vertical axis) as computed over the 1972-2001 time period. While the 1974 data point would capture the same metric computed over the 1974-2003 time period. As explained in the introduction, following the work of Markowitz and Sharpe, risk is usually assimilated to volatility, which is typically computed by the standard-deviation formula applied to a data series (e.g. portfolio balance, portfolio returns). Such perspective is very focused on the short-term ups and downs of the data series. As to reward, this is usually assimilated to real (inflation-adjusted) returns and the corresponding compound growth (CAGR). 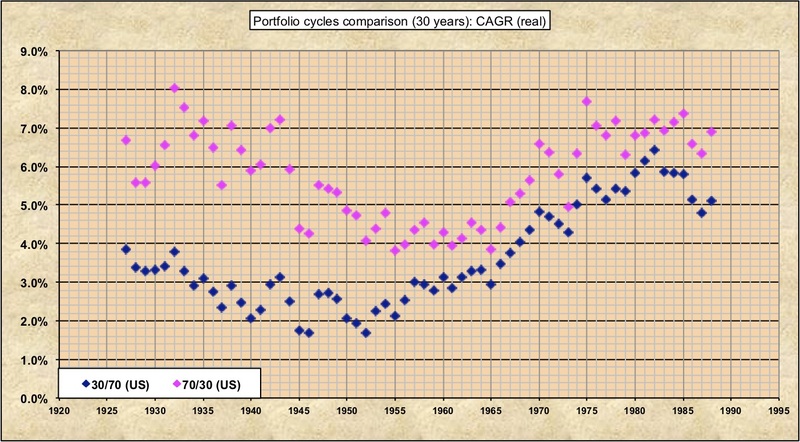 CAGR is a measure of cumulative growth of a portfolio without contributions or withdrawals along the way. Both metrics are easy to compute and widely used. Let’s give a try. 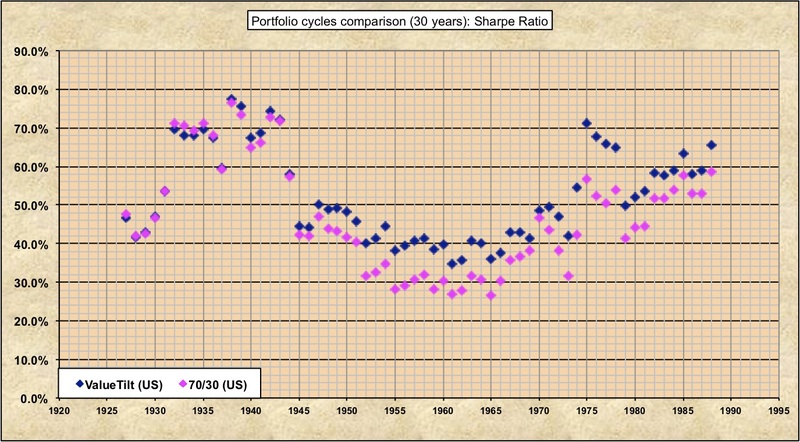 The following charts compare a 30/70 portfolio (30% US stocks, 70% US bonds) to a 70/30 portfolio (70% stocks, 30% bonds). 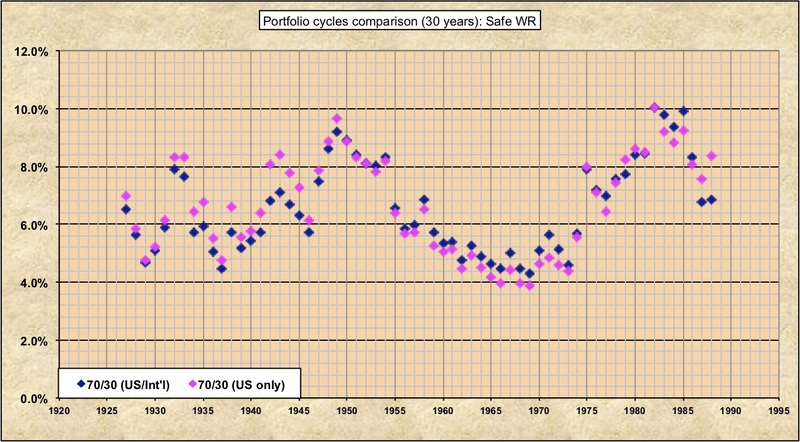 From a reward (real returns, CAGR) perspective, the case seems pretty clear, 70/30 annualized returns were always higher for every cycle of 30 years, irrespective of the starting year (pink points on a given vertical are always significantly higher than the corresponding blue point). Now let’s look at risk (standard deviation) perspective. The case is unsurprisingly exactly opposite, the 30/70 portfolio always displaying significantly lower volatility for each retirement cycle. 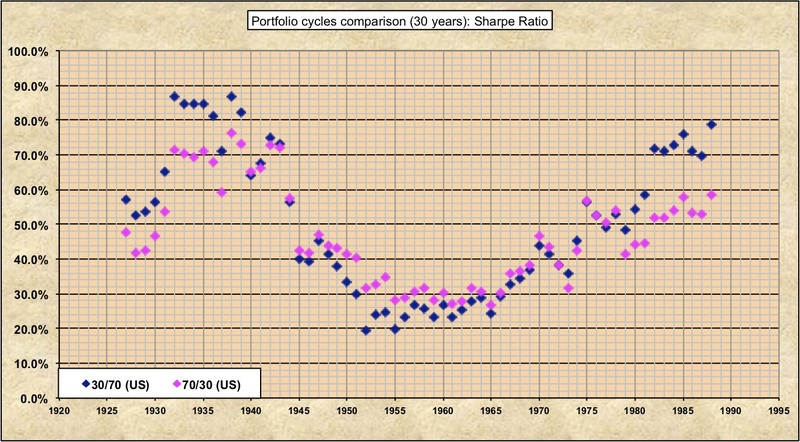 William Sharpe came up with a clever ratio (dubbed the Sharpe ratio, of course), which directly compares the return metric to the standard deviation metric (with a calibration against the so-called risk-free rate), so let’s try to use such ratio to decide which portfolio provided the best risk-adjusted reward. 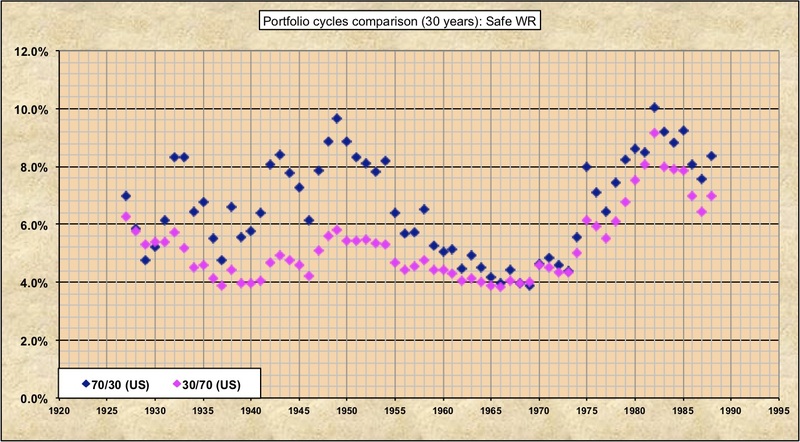 This isn’t quite conclusive, although the 30/70 portfolio displayed a really poor Sharpe ratio for retirement cycles starting in the 50s and 60s (likely due to post-war inflation devastating bond returns by then). Using a value tilt in the portfolio is more interesting in this respect. For example, a portfolio with 30% Total-Market, 20% Mid-Cap-Value, 20% Small-Cap Value and 30% Total-Bonds would have fairly consistently displayed a better Sharpe ratio than a regular 70/30 portfolio, a fact that generated a lot of academic literature, and lead many people to introduce a value tilt in their portfolio. Why? This provided “better risk-adjusted returns”. But… how meaningful is that in the day to day life of retirees? The main question is how useful is this type of academic analysis for retirees? One could perceive that solid returns are important (so that annual expenses are properly balanced by portfolio growth) and that low portfolio volatility is important too (e.g. to reduce emotional distress and avoid unfortunate emotional decisions). Standard deviation is really not such a good statistical metric for data series like stock returns and bond returns, which do NOT act as normal distributions (remember those bell curves?). Also, what’s wrong with returns (and portfolio balance) deviating upwards? The time horizon of relevance is the entire retirement period. Low volatility in the early years might provide a sense of comfort, but low returns could lead to severe issues twenty years later, due to a slowly depleting portfolio. This type of long-term risk is totally ignored by the volatility vs. returns line of thinking. What truly matters to most retirees is purchasing power, year over year, across the entire retirement period. Inflation-adjusted income from the portfolio in other words. This income perspective directly impacts quality of living, much more significantly than the portfolio’s ups and downs. Periodically withdrawing from one’s portfolio presents Sequence-of-Returns risks, which are not captured by the CAGR metric. For a given time period (e.g. 30 years), the very exact same annualized return (CAGR) could lead to ruin if a deep crisis occurs early, while the portfolio might do fine if a bull market occurs early (followed later by a severe correction). If the retiree is fortunate enough to live through an extended bull market, being overly conservative is counter-productive. We have only one life. Taking advantage of upsides should be nearly as important as mitigating downsides. Michael McClung (the author of “Living Off Your Money”) defined risk for retirees as loss of income (over the entire retirement period) instead of loss of value (of one’s portfolio at one point in time). In short, loss of income vs. loss of value. This seems solid common sense, that could be expanded to “concrete risk is low income, concrete reward is high income — while portfolio value is more related to emotional risk”. A well-known metric is the Safe Withdrawal Rate (SWR) – occasionally referred to as Sustainable Spending Rate (SSR). The idea is simple, for a given starting portfolio, how much could we have spent (a fixed amount, inflation-adjusted) every year, without depleting the portfolio at the end of the retirement period. This is a very interesting metric because not only does it provide a number very directly associated with income (or lack thereof) coming from portfolio withdrawals, but it also captures quite neatly Sequence-of-Returns issues. There are some obvious challenges though. Such metric can only be computed in hindsight (after the fact, based on a given sequence of historical returns). Which lead many people to only consider the lowest SWR that would have worked in the past. Which is a single data point in history, hence not terribly meaningful for the future. This wouldn’t protect a new retiree against a uniquely dire future, while leading most retirees to NOT take proper advantage of any moderately rosy future (i.e. upsides). Still, let’s run a quick historical analysis (in hindsight) about such metric, using our methodology of varying the starting year and investigating 30-years (retirement) cycles. Note that the % numbers on the vertical axis are easy to convert to (inflation-adjusted) income, if you saved $1M, then a 5% SWR would allow $50,000 annual withdrawals. One could argue that the 70/30 portfolio didn’t help in the (most troublesome) late 60s and early 70s, and was significantly inferior for the 1929 starting year, so why bother with the emotional ups and down of a stock-heavy portfolio? 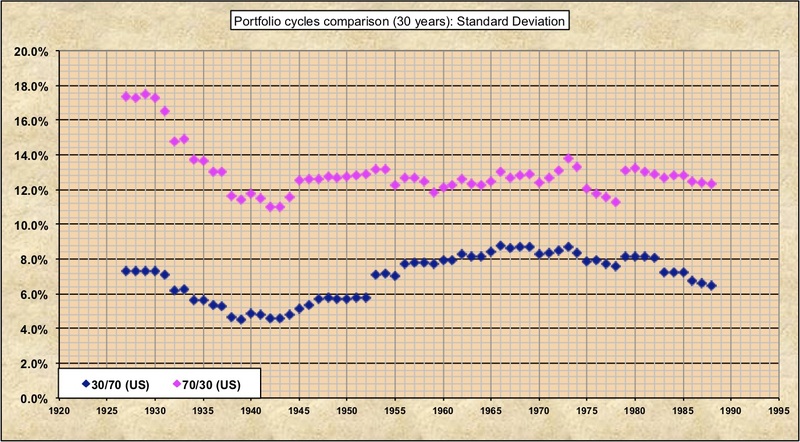 One could argue that, besides the 1929 oddity, the 70/30 portfolio was as adept at mitigating the dire starting years as the 30/70 portfolio (actually often slightly better), while being clearly much better at navigating upsides for rosier starting years. But then, how can we take advantage of that, without perfect foresight? Not having a good answer to the last question, many people unfortunately retreat to the ‘glass half empty’ perspective, and do retirement planning based on the magical ‘4%’ number from the Trinity/Bengen studies (e.g. 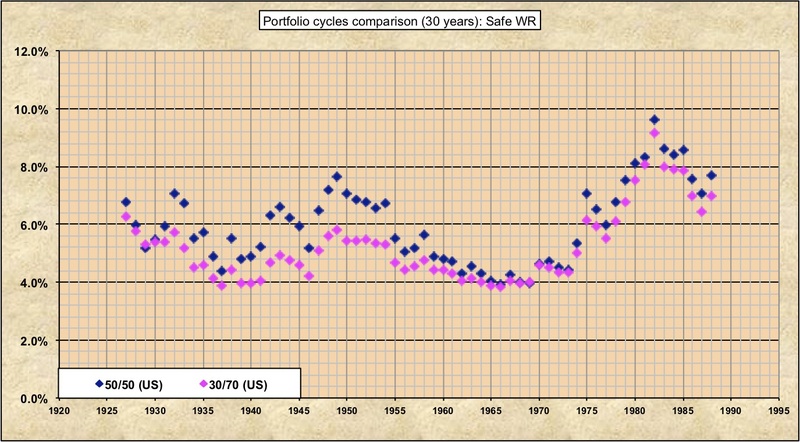 the lowest value on our previous SWR graph, the minimum of all known SWRs). Without acknowledging that in many countries outside the US, this would have failed a retiree in multiple occasions, and that there is no guarantee that there will not be a more dire future in the US at some point. This would also basically be giving up on the upsides from any minimally rosier scenario. Such perspective seems a very flawed risk/reward assessment. What else can we do, though? Truth is nobody in their right mind should use a fixed (inflation-adjusted) portfolio withdrawal, year over year. Real life cannot be conducted in hindsight, and our forecasting crystal ball is (very) cloudy. If one were to choose a (fixed) withdrawal rate that turns out to be inadequate, the consequences could range from troublesome (e.g. overly constraining yourself and leaving way too much money to heirs) to downright catastrophic (e.g. premature bankruptcy, no ability to cover long-term care costs, etc). Being adaptive, tightening the belt in dire times, and splurging a bit in rosier times can go a long way in making things much better for a retiree. As everything in financials, having a well-defined plan is key to success. Various variable withdrawal methods can provide a robust and adaptive plan. Decision rules as defined by Guyton-Klinger (or a simplified subset of such rules) can provide a sound approach to do so. Actuarial methods centered on the use of the PMT() loan calculating function provide an excellent framework, with several possible variations (including one often discussed on the Bogleheads forum dubbed VPW). Although the author performed many rounds of detailed analysis about such methods, the objective of this blog article is NOT to enter in a detailed discussion about variable withdrawal methods, but just to hone on a specific risk/reward consideration. An author named David Blanchett made a very interesting observation. He pointed out that if a variable withdrawal method, WITHOUT any foresight, can deliver an average income over the entire retirement period that is fairly close to the SWR computed in hindsight, then this makes for a pretty efficient method, notably if the variability of withdrawals stays within reasonable bounds. He actually came up with a corresponding metric called the Withdrawal Efficiency Rate (WER) in this article. Long story short, extensive tests performed by the author demonstrated that the soundest variable withdrawal methods (e.g. PMT derivatives and a few others) are capable of impressive WER scores (e.g. 90% or higher). In other words, the SWR metric obtained in hindsight (while backtesting) summarizes quite closely what the best variable withdrawal methods would have achieved without foresight. When backtesting, SWR is therefore a pretty solid measure of both risk (for starting years where it ended up low) and reward (for starting years when it ended up high), for a given asset allocation. This requires to accept some level of income variability though, through the disciplined use of a sound withdrawal method. Note that, in real life, fixed income (e.g. SSA, Pensions or annuities) will typically provide a solid buffer when combined with such variable portfolio withdrawals, making the variability of income easier to deal with. Armed with this line of thinking (SWR is a concise and informative indicator of both risk and reward for a retiree), let’s come back to our portfolio comparison. Let’s be a bit more fine-grain and add a 50/50 portfolio to the comparison. Hopefully, the reader will now start seeing such graphs with more of a glass half-full perspective, when trying to assess which asset allocation was the more risky or the more rewarding. For kicks, and without delving too much in factor analysis, here is the corresponding ‘value tilt’ comparison (remember, the ’tilted’ portfolio splits the equities 30% Total-Market, 20% Mid-Cap-Value, 20% Small-Cap Value ). Interesting, isn’t it? Note that, as the saying goes, the future will probably rhyme with the past, but the past ain’t the future… The point of those charts is not to come up with hard numbers for one’s future retirement, just to observe general patterns. Please draw your own conclusions about the future. Emotional risk: 70% stocks, really? By now, some readers are probably shaking their heads about the stock-heavy asset allocations being explored. Is this REALLY suitable for retirement? Well, from an income perspective, if one is ready to use a (sound) variable withdrawal method, then yes, the case seems pretty solid, and captures a risk/reward equation truly palatable for retirees (in essence, purchasing power expectations). Still, even if the income-centric perspective seems to better capture the primary goals of most retirees, emotions related to the trajectory of the portfolio (e.g. its ups and down) cannot be ignored. This can lead to emotional distress and behavioral mistakes, hence a form of risk. The author would argue that readers having done it this far in this long write-up are probably passive indexers, used to strict ‘stay the course’ discipline, quite knowledgeable about past crises and somewhat immune to financial noise and panic affecting more naive investors. Still… emotions undoubtedly matter, if only for the discomfort they bring. Instead of coming back to the not-so-useful volatility metric, maybe a drawdown chart (in nominal terms) would better capture such emotional risk. 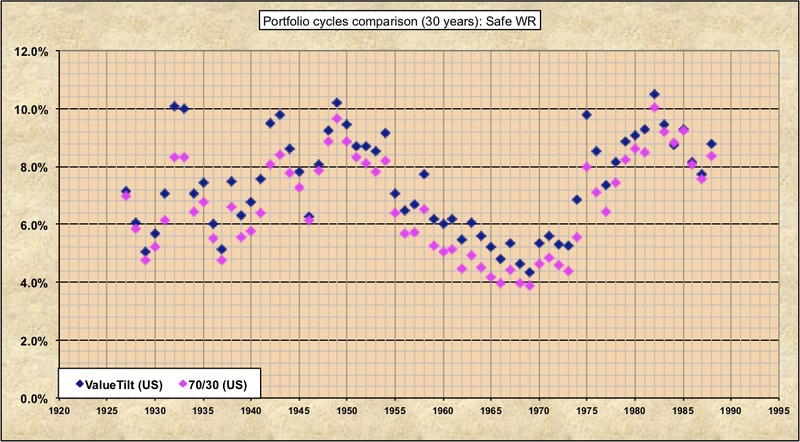 Let’s compare a 50/50 portfolio with a 70/30 portfolio, over the entire 1927 to 2017 time period, and see how far did the portfolio value drop from its highest point (year over year) during crises. Some drawdowns were quite severe, and for sure, the fortitude of a 70/30 investor will be challenged. One should remember though that steep bear markets usually follow steep bull markets, somewhat blunting the effect of the most dramatic drops. Whether such trajectory is acceptable or not is up to the reader, and highly depends on personal considerations, financial and behavioral. Note that drawdown recoveries were relatively fast in the US history of the stock market (e.g. a few years), but this wasn’t always the case in other countries, and probably shouldn’t be relied on in the future. In any case, the double (2000/2008) or triple whammies (1929, 1937, 1941) were certainly quite disturbing. Now, let’s compare a 50/50 portfolio with a 30/70 portfolio with the same parameters. The green line is certainly very attractive, but one has to really question the logic of the retiree here. Would you really be unable to emotionally manage a 30% or even 20% drawdown (which usually comes right after a bull market)? Is avoiding such situation really worth missing on the income (i.e. purchasing power) trajectory that the SWR charts illustrated? The answer is very personal, depending on one’s priorities. International returns are only available since 1970 in the official version of the Simba spreadsheet. 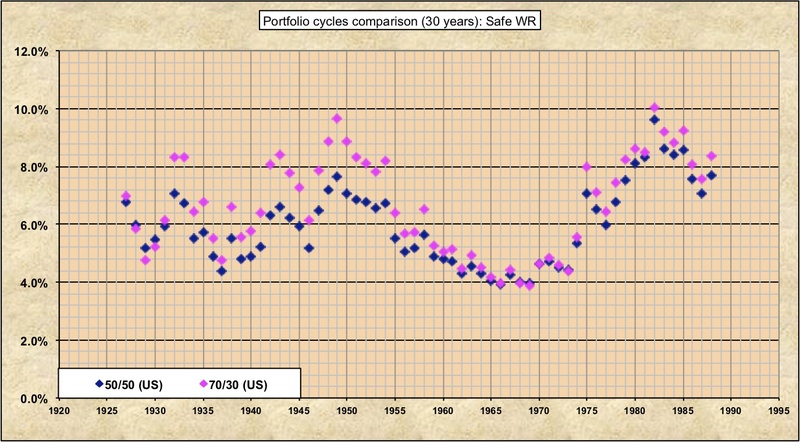 The author has private access to approximate numbers for the pre-1970 years though, allowing to assemble SWR charts and to check the value of International diversification over a longer period of time. The following chart uses a 70/30 asset allocation in both cases, one fully domestic (US), the other splitting equities 50/50 between US (domestic) and International (rest of the world). As we can see, this is a bit of a mixed bag, staying domestic would have been wiser before 1950 (not surprising in hindsight, given the destruction of most developed countries during WW-I and WW-II ) while in more modern times, international diversification would have helped to mitigate the most difficult starting years in the 60s. Note that the blue points seem to be rather close to the pink points for the troublesome 60s, but the difference is roughly half a point, hence quite a significant difference in terms of extra income over a full retirement period. 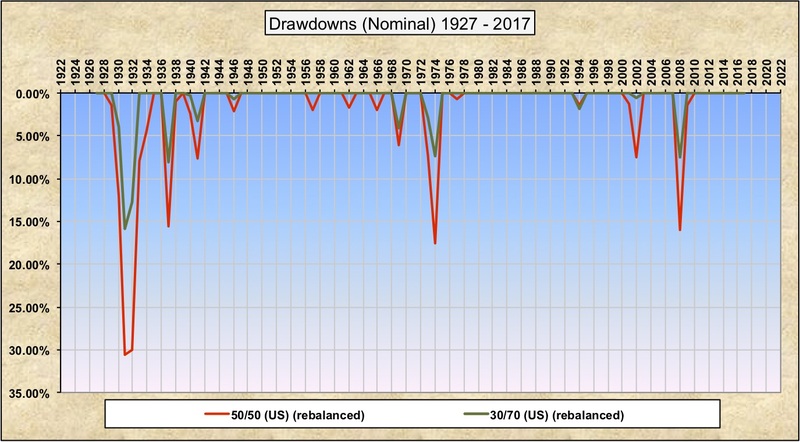 As to drawdowns, the author ran a quick test, which showed that it wouldn’t have made much of a difference. The Safe Withdrawal Rate metric turns out to be a very practical and meaningful measure of both risk and reward for retirees. Such perspective factors in portfolio growth (or lack thereof), sequence of return risk, and withdrawals over the entire retirement period. The use of a sound variable withdrawal method is key to benefit from upsides as well as mitigating the effect of downsides. The old sage Peter Bernstein wisely suggested a fixed 60/40 asset allocation for retirees. When looking at concrete risk and reward (i.e. income-centric), he was probably more on target than some ill-advised 30/70 recommendations of late, which overly emphasize the impact of volatility. Keeping a significant engine of growth in one’s portfolio should definitely matter for most retirees. How much stock exposure to select has to be weighed against emotional risk though, notably the psychological impact of deep crises. This article primarily explored a perspective on risk and reward, illustrated by a few very simple portfolios. The same kind of analysis can be performed by readers on numerous other passive portfolios, using the Simba backtesting spreadsheet. more technical details about the tie-in between SWR, WER and variable withdrawal methods (done: check it here). Any other idea for further investigation would be welcome.